View Cart “ATAK” has been added to your cart. NOTE: Do not purchase this supplement until after Step 4 of Gut Thrive and only if you at that time you are still suffering with bloating, constipation, and brain fog. Please make sure to download instructions for these formulas and read them carefully before taking. This is the “next generation” of the former Nc (Calm) formula, backed by science and breakthrough research regarding brain neurotransmitter function. Features herbs and nutrients that support the body’s adaptive response to stress through their influence on the Hypothalmic/Pituitary/Adrenal (HPA) axis. Provides study-backed adaptogens and nutrients such as cordyceps, and rhodiola; as well as neurotransmitter supportive S-adenosyl-L-methionine (SAMe) and Dehydroepiandrosterone (DHEA), all of which play an important role in improving mood and support a healthy adaptation to the body’s stress response. 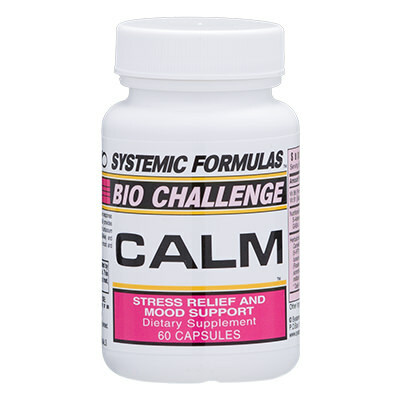 Note that CALM contains the ingredient (GABA) which is restricted from import to New Zealand. We do not recommend purchasing this product for shipment to this country. Camilla sinensis – Provides Herbalomic™, epigenetic and antioxidant attributes of green tea. SAMe – S-adenosyl-L-methionine. Helps relieve depression. Part of the methylation pathway. Pain reliever. Helps produce melatonin necessary for sleep. Supports detoxification. Griffonia simplicifolia – An herb bearing Natures 5-HTP. Anti-infective, aphrodisiac, and kidney/bladder supportive; it’s traditionally used for anxiety, depression, migraines, insomnia, and appetite regulation. DHEA – Dehydroepiandrosterone – The building block of estrogen and testosterone synthesized in the adrenals, gonads, and brain. An antioxidant known to help stimulate human growth hormone associated with anti-aging processes. Increases insulin receptor sensitivity. Helps the body recover from stress. Enhances mood by increasing serotonin. Mucuna pruiens (L-Dopa) – An East Indian adaptogenic herb, Cowhege, contains Nature’s L-Dopa, the precursor to the neurotransmitter, dopamine, which helps release human growth hormone, a key factor In longevity. Famous for enhancing sexual pleasure, improve lucid dreaming, improves more youthful hormone levels. GABA – An inhibitory neurotransmitter that calms the excitatory brain processes. Improves mood. Counterbalances glutamate. Improves brain focus. Sceletium tortuosum – often called a “mood elevator,” relaxant, empathogen. Supports the sensitivity of dopamine and serotonin receptors. Help with anxiety. Provides energy. Help relieve overactive appetite. Improves brain synapse connection. L Taurine – An amino acid for stress relief. Facilitates production of the neurotransmitter GABA. Also reputed to help the body burn fat by supporting beta oxidation. Improves cellular insulin receptivity for better glucose transport into the cells. Helps muscle recovery and supports cardiovascular health. Delays cognitive decline. Improves learning and retention. Melissa Officinalis – Lemon balm. Improves mood and mental performance. Studies show helps with Alzheimer’s. Antioxidant. Tryptophan – An essential amino acid and precursor to the neurotransmitter, serotonin. Can improve depression. Beta-Alanyl-Histidine – Carnosine, a dipeptide of amino acids beta-alanine and histidine, is highly concentrated in the brain. Reduces telomere shortening rate contributing to cellular longevity. An anti-senescence nutrient. Reduces advanced glycation end products which contribute to plaque and Alzheimer’s. Hypericum Perfoliatum – St. John’s Wort is long known to help alleviate depression and support neurological function. The rigorous German Commission E studies cite its ability to slow down serotonin uptake, thus facilitating better mood. Helps ADHD. Cordyceps militaris – An ascoparp created by the Ascomycota fungus, famous for being an adaptogen, immune system enhancer, energizer, and provider of building blocks of RNA and DNA. Antioxidant and stabilizer of blood pressure. Oxygenator. Renowned for anti-tumor propreties. Ociumum santum – Holy Basil. Features anticancer, antidiabetic, antifungal, antimicrobial, hepatoprotective, cardioprotective, antiemetic, antispasmodic, analgesic, adaptogenic and diaphoretic actions. Mentally stimulating, de-stressing, and anti-aging, anti-dementia.